Jupiter Movers – Since 2001 Discount South Florida Movers has been helping people in the South Florida area with all of their moving needs. Our team of professionals can help you plan out every detail of your move and the on-site supervisor will ensure everything runs smoothly. We guarantee that you will be completely satisfied with your moving experience. We have a wealth of expertise in residential and business/office moves. We can securely pack your belongings, or if you just need quality packing material we have that too. If you have large, delicate items like a piano or even a pool table let us know and we can move those as well. Contact us today and get your no obligation estimate and see why our rates are the lowest around. Jupiter is a town of 61,000 in Palm Beach County, in the north east corner of the county. First settled in 1860 as the Jupiter Inlet Lighthouse, it was later incorporated in 1925. The lighthouse still stands to this day even after Hurricane Jeanne. The lighthouse also serves as the unofficial symbol of the town. It’s location along the edge of several tropical climate areas the town experiences some of the most rain in the country. Aside from the Jupiter Inlet Lighthouse, there are many other attractions in the town. The Miami Marlins and St. Louis Cardinals both have spring training facilities there. The Palm Beach International Raceway also resides in the town and is host to several professional races every year. There is also a Max Planck Society located in the Florida Atlantic University campus in the town. 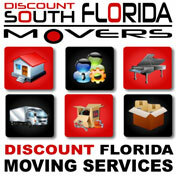 Discount South Florida and Jupiter movers provide low rates on residential, commercial, piano and long distance moving.